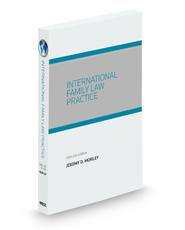 My book, International Family Law Practice, has now been published. DescriptionThis title provides a practical approach for U.S. lawyers handling international family law matters. It focuses on international marriage and divorce, international prenuptial and postnuptial agreements, international divorce planning, recognition of foreign divorces, international child support and custody, international relocation of children, and international child abduction. It will also be helpful to lawyers handling international family matters globally. -Includes discussion of foreign law. -Includes practical checklists and practice pointers throughout. -Provides broad coverage of international family issues.